One of the most attractive things about live recordings for me is that they seem to capture something at once exceptional and routine. Exceptional in that they capture a trace of that moment Dolphy spoke of which is otherwise ‘gone in the air’; and routine in that they capture something more ‘ongoing’ about the relationships of the musicians on stage, and invite reflection about what it was like on all those other, unrecorded, nights. 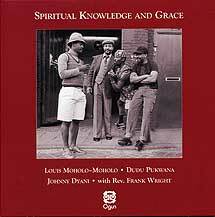 On this, the first official release of a 1979 concert in Eindhoven, the Reverend Frank Wright (subbing for an indisposed Chris McGregor) joins the other three of the then-surviving Blue Notes – Louis Moholo-Moholo, Johnny Dyani, and Dudu Pukwana – for two 30-minute-plus sets; half-hour journeys taking in visits to various half-realised themes. The resulting group dynamics are fascinating: the ‘three and one’ of the South Africans and their American guest; the ‘one versus one’ of two combative saxophonists each with plenty to say for themselves; the ‘one and one’ of the same two saxophonists, whose shared enterprise is to make music together; and the ‘us and them’ of a rhythm section on devastating form that day, seemingly offering infallible support at the same time as threatening to overwhelm anyone in their way. There is also here the captivating dynamic which can result from the juxtaposition of strong, simple diatonic ideas with the farthest reaches of expressionism – think, for example, of the music of the Brotherhood of Breath, or of Albert Ayler (with whom Frank Wright had worked). To my ears, Dudu always had a gift for blurring these ideas in any case – making the melodic sound intensely expressionist, and the most ‘out there’ expressionism essentially melodic; and, unsurprisingly, he is the horn player who generally ‘makes the first move’ – introducing a new melodic fragment to worry, or jumping in on top of a Dyani bassline. Wright typically takes stock of the new situations, and then – being a card-carrying tenorist – wades-in with his own magnificently brawling contributions. But wonderful as the horn players’ contributions are – Dudu as urgent and searing as ever playing on the themes, Wright trying to blow them apart – it’s the rhythm section which floors me on repeated listens to this album. On some recordings (often in the Brotherhood, for example), it’s Louis’ bass drum which is the heartbeat; in recent times, it’s often been his ride cymbal which corrals the band; and at the outset here, it’s that martial snare drum which dictates, crackling in a way that it crackles only in his hands, or those of Roy Haynes. The energy which he summons and transmits throughout is extraordinary, as is his mastery of pacing: starting with an almost alarming intensity, never letting it flag, and indeed, consistently ratcheting it up, just when another crest would seem impossible. Together with Dyani’s mile-deep sound and mile-wide ‘pocket’, the effect is spectacular. Thinking about it, Louis would probably call their feel ‘DANGEROUS’. I’m trying to imagine playing with this rhythm: what would my precise balance of exhilaration and intimidation be? Not to say that there isn’t shading: amongst other things, the shifting textures resulting from Dudu and Johnny taking occasional turns on the piano, and Wright even spelling Dyani on bass at one point, see to this. At any rate, going back to my idea of the exceptional and the routine. As I write about this album, I seem to be writing more about the exceptional than the routine. And that makes me slightly uncomfortable, because I’m loath to romanticise one single night, especially one in the career of such a great working band. So maybe that’s the best way to leave it: for those who didn’t have the good fortune to hear these musicians ‘back in the day’, and to garner some idea of the extent to which this was just one night amongst many, this is an essential release. For those who did have that good fortune, please listen all the same, so that you can tell the rest of us if it really was this good every night.